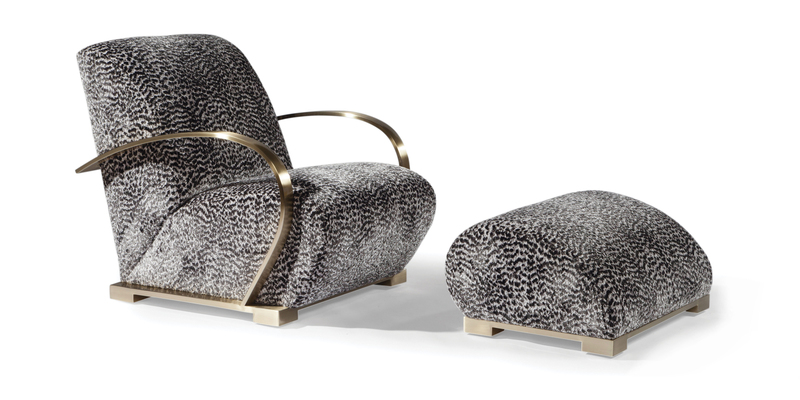 Originally conceived in the 1980s, the metal and upholstered Streamliner lounge and matching ottoman showcase Milo Baughman's affinity for the Streamline Moderne with its bold aerodynamic forms and glamorous sense of modern motion. Available in polished stainless steel or stain brass finish, the Streamliner has been updated with Marshall springs and enhanced frame and cushioning technologies to make this glamorous beauty even more comfortable and durable. Choose from any of our in-house curated fabrics or leathers for upholstery or provide COM. W 29 | D 39 | H 32.5 in. W 29 | D 23 | H 14 in. Arm, base and legs: polished satin brass finish.